This morning, we’re going to just dip our toes into the gospel of John for a minute to take a look at one of Jesus’ first miracles. In the chapter directly before this, Jesus has spent two days calling disciples: Simon Peter and his brother Andrew, Philip and his brother Nathanael, and another disciple who goes unnamed at this point. It’s also important to remember as we hear this story that overall, the gospel writer’s goal is to communicate to us that Jesus is the Son of God—the King of Kings who is both all-powerful and very human. I have so many questions about this story. Why were they at a wedding in Cana? Whose wedding was it? Did they run out of wine because Jesus showed up with five extra guests whom he’d known for about two days? How did Mary know that they had run out of wine, and how did she know Jesus would do something about it? Why did Jesus tell her it wasn’t his problem, and then go and do this anyway? This happens to me a lot with biblical narratives—I want to be able to picture the moment in my head, to hear whether Jesus was sassing his mother or quietly begging her to keep the secret about what he could do. I get so caught up in the details that I think are missing that at first, I often miss the larger points and the bigger question. This is probably the same reason I can very easily get sucked in to the endless scrolling through random videos on Facebook. Does anyone else do this? For some reason, a ton of Facebook’s recommended videos for me are nail art—like, the most intricate manicures you have ever seen. (Which, as you can see, is incredibly relevant to my life.) I ran across one particular video the other day where the artist was making tiny 3D animals out of acrylic gel, just a couple of centimeters high, and attaching them to someone’s nails. And the only answer I could come up with was: because they could. We could ask the same question of Jesus in this story, and we would probably get the same answer. This is one miracle that on the surface, doesn’t seem to play much of a part in Jesus’ larger mission of showing us the kingdom of God. He’s not changing lives or feeding the hungry or healing the sick. The only people who know what he did are the servants who hauled in somewhere between 120 and 180 gallons of water, those 5 disciples, and probably his mother. He does it because he can, and although the text doesn’t tell us this, I think he does it because Jesus knows the value and importance of celebration and joy. As an aside, here’s your necessary reminder that alcohol isn’t a requirement for joy—part of this story that’s easily overlooked is the ancient cultural expectation that a wedding feast is a celebration for the whole community, not just a private party. Just as any of us would be mortified if we threw a dinner party and ran out of food halfway through, so it would’ve been really bad form to have invited everyone and then run out of drinks. It may have cut the celebration short, and it may have damaged the newlyweds’ relationships with their neighbors. What Jesus does here, then, is infuse this celebration with God’s abundant generosity, filled to the brim and overflowing, so that this delight, this moment of rejoicing together in community might continue. But as we encounter this text a couple thousand years later, I wonder if it seems a little unnecessary. For some of us, hearing a story like this about seemingly random extravagance can make our own stories of scarcity—economic, emotional, and political—loom even larger in our minds. According to Feeding America, there are currently around 40 million people in the United States who are food insecure, which means they don’t have stable access to even basic necessities. According to the VA, there are about 8 million people in the US right now living with Post-Traumatic Stress Disorder—trauma survivors, military personnel, first responders, and many more. Just in Licking County, there are more than 500 children and teens living in foster care. We just finished the longest government shutdown in history, with hundreds of thousands of people either working for free or not working at all, in which both parties are placing blame solely on the other. Even on a personal level—it’s January, it’s still winter, it’s cold and snowy outside, we’re still dealing with family drama left over from the holidays, and the anxiety hangover from all of that shopping and busyness and all of those expectations is hitting us hard. So maybe Jesus turning water into somewhere around 150 gallons of wine so that folks could celebrate a wedding seems a little irrelevant at best, or even wasteful at the worst. 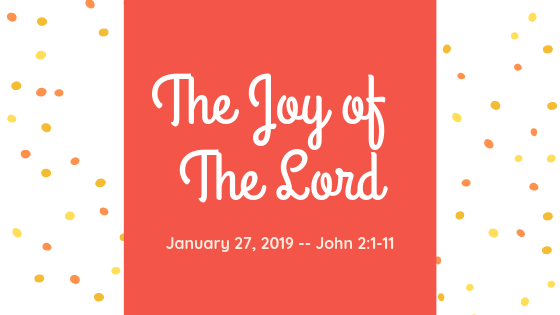 Instead, we’re offered a glimpse into one part of Jesus’ life and witness: that he did not shy away from joy and celebration when the situation called for it, even when the world around him was frustrating and dangerous. Just as there is no flower that blooms every day of the year, so we cannot be expected to be happy and content and celebrating all the time. We have to be able to make room for all sorts of feelings and ways of being in the world—including grieving our losses and making changes and questioning what we’ve been told. And this story reminds us that the reverse is also true: we are not built to be angry all the time. We cannot sustain a life built solely around rage or fear—we have to be able to find joy, to celebrate occasions large and small, to watch for beauty and hope even in the bleakest of moments, and when we find them, to hold them close to our hearts for as long as we can. So take a look at the life of Jesus, and remember that it’s okay to say that things are not okay—to have courage and do justice—and at the same time, when the occasion arises, I hope we can take Jesus’ lead and dance and rejoice and celebrate, even if it’s in spite of our circumstances. Sometimes, God’s abundant generosity is impractical, unpredictable, and unexpected. But when it comes, may the joy of the Lord give you strength, and may it strengthen your faith in the one who created you, who loves you, and who holds you in the palm of his hand.